What are the real, tangible benefits of investing in mortgage notes? What are the practical advantages for you? These benefits are just the tip of the iceberg. The bottom line is that whether you are looking to beef up and supplement your current income, prepare for retirement, add lump sums of cash to your bank account to propel your portfolio, or just level up your long term wealth building – note investing can be a very smart move. Real estate notes offer higher than average rates of return, often ranging from 5% up. It’s easier to manage notes than to manage rentals. Note owners don’t have to worry about evictions or maintenance like landlords do. With mortgage notes, you’re working with investors or homeowners, not renters. That means payments are coming from someone with an equity and/or emotional stake in the property, making note ownership a safer bet than owning the property itself and dealing with the mentality of renters. After purchasing a non-performing asset, the first rule of thumb is to work with the homeowner to design a payment plan and loan terms that work for their financial situation. The key is to engage the homeowner, build trust and keep their best interest at heart. Often, there are short term circumstances such as a health issue, job loss or divorce that prevents homeowners from making full payments on their mortgage loan. By purchasing the notes from the bank at such deep discounts, you’re able to create a “win-win” scenario until they get back on their feet. 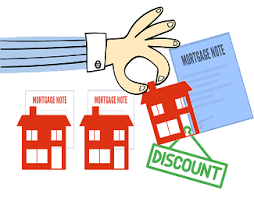 Other strategies are payment plan reinstatements, reinstatement with discounts, refinancing, seller assistance, deed-in-lieu of foreclosure and foreclosure as a last resort.